The Parachute Pavilion will be a source of recreational and cultural activity for the area of the iconic Parachute Jump tower. The boardwalk is extended as a piazza. Decking is proposed as wall cladding and flooring to suggest continuity between inside and outside. 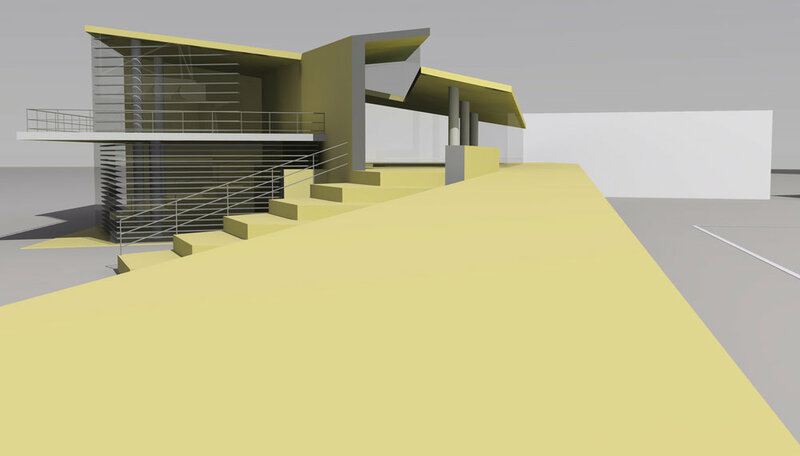 The project includes: a shop with large storefront and directly accessed from the boardwalk to attract customers, a Bar/Restaurant raised on a terrace to enjoy panoramic views of the sea. A Special Events Space with flexible high-ceiling space featuring a projection screen and an information desk to update visitors on events and performances. Service, Offices, Delivery and Storage Areas are located at the lower level to minimize visual obstruction from the existing boardwalk level. A resin cast heart as signage is strategically situated on the north facade. A southern stepped Solarium doubling as outdoor theater for street artists performances is configured as a proposition of the possible future landscaping of the remaining park area. The proposed Parachute Pavilion is built with a mixed structure of wide-span steel and RC walls to allow an open plan, it features a sedum roof, brise-soleil system at south elevation and glazing panels with integrated solar shading to minimize solar heat gain while maintaining transparency.